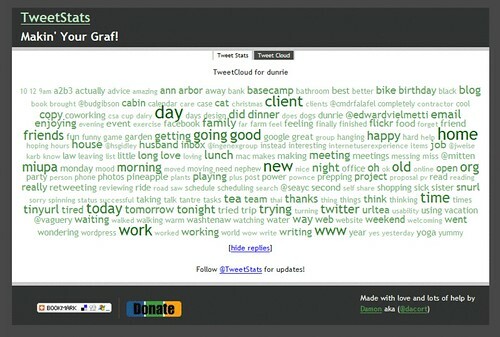 My Tweetcloud by tweetclouds and tweetstats - Scientific Ink seems pretty biased towards recent tweets – see “staycation”? I only said it once, just recently. looks like I retweet a fair bit, and that I talk a lot about gardening, soup, and yoga. OK onto tweetstats. My tweetstats tweetcloud seems less centered on my last few tweets. “Ann Arbor” and “yoga” are less prominent, and “work” is more prominent. “client” “day” “home” “new” “time” “today” “work” and “www” seem prominent. I’m also noticing “tired” in there, and “tea”.